Mix together dry ingredients with wooden spoon. You shouldn’t need to use a mixer for any reason. Add milk. Mix well and add water. If batter is too thin, add some more flour. If batter is too thick, add more water. I had to add about 1/4 cup more flour for some reason because my batter was very thin. Usually the recipe is pretty spot on. Once the butter is melted and starts to bubble, add 1/4 cup batter to pan in 2-3 different spots depending on size of pan. A medium-sized pan will be big enough for 2 pancakes at a time. Cook on one side until you see bubbles form in the pancake. Since I like a more doughy pancake, I flip as soon as I start to see bubbles around the edges. If you like a firmer pancake, wait until you see bubbles in the center. My pancakes are usually an off-white color. Some people prefer brown or golden brown pancakes, so feel free to wait until the pancake reaches your preferred color. Flip and let sit for 30 seconds to a minute. The second side will cook much faster. Flip to the front once more and then quickly flip to the back again. When I flip the second time, I usually only leave on a side for about 10 seconds. Remove pancakes from heat and repeat until all the batter is made into pancakes. Top with desired topping. 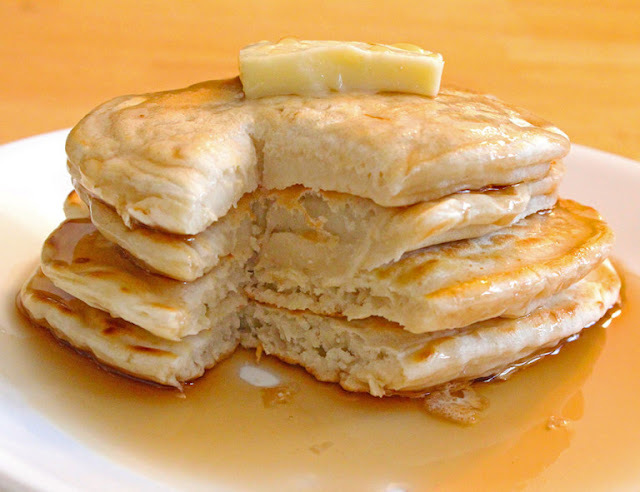 I’m boring and eat my pancakes plain, but I know most people prefer butter and/or syrup. One of my family's favorite breakfast, even sometime my daughter beg me to made this pancake for her launchbox. So Fluffy, so yummy and delicious. Lets Try it!